Nine years of skiing at least once a year means I’ve got my ski packing list down to a fine art. 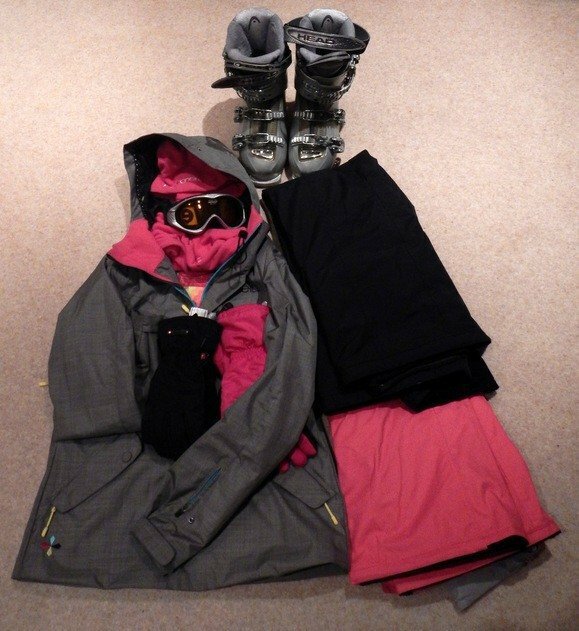 It can be a challenge knowing what to pack for a ski trip but it’s crucial you get it right. The last thing you’ll want to be thinking about when ripping through the powder is numb fingers or worrying about getting a sunburned nose. Not a good look. To get the most from any ski tip you’ll need to have the right ski equipment and gear to be protected from the elements and any tumbles you might take. 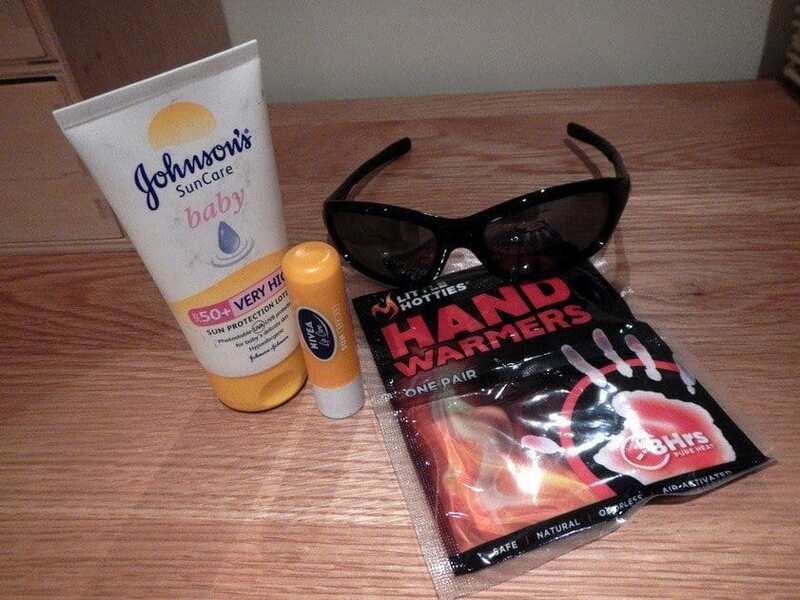 Whether it’s spring skiing in the sunshine or winter white-outs here are my top tips for what to pack for a ski trip. 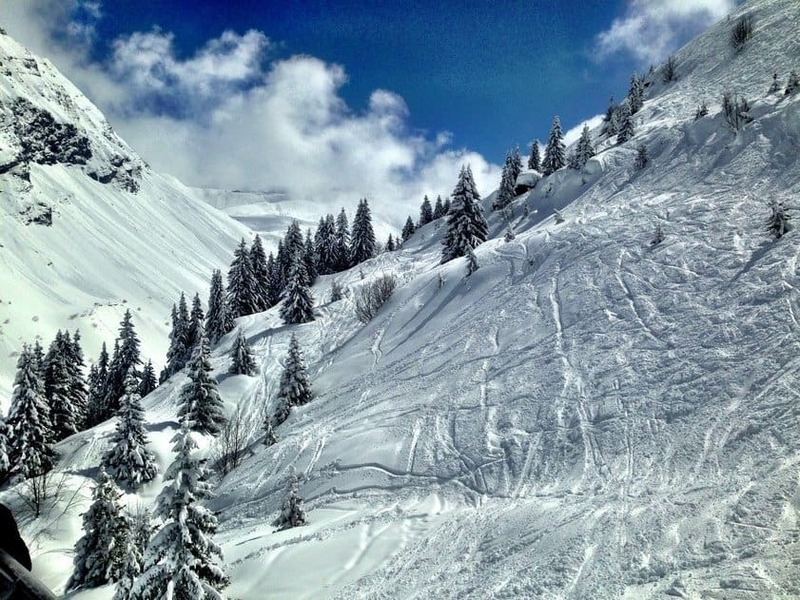 And as I like you, I’m including a free downloadable ski trip packing list. 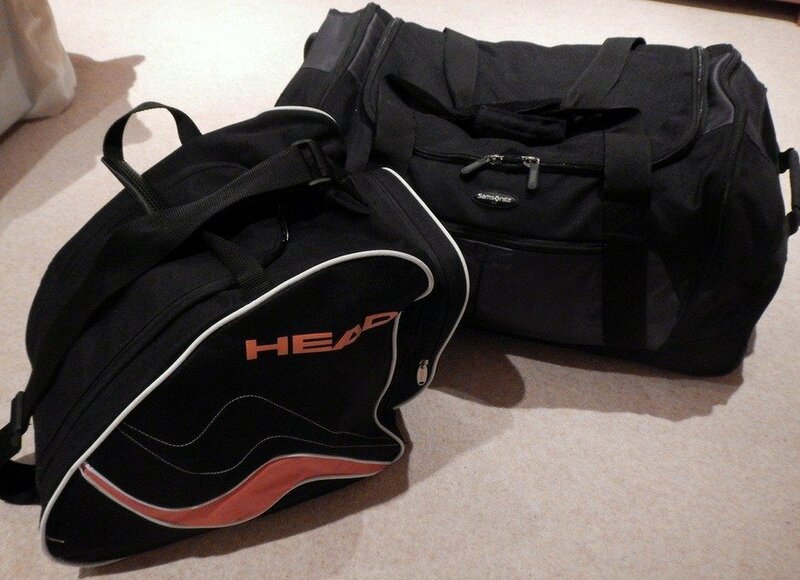 What you take in terms of ski equipment will depend on the way you’re travelling. If you’re flying, the additional luggage costs may mean you won’t want to take your own equipment. It could be cheaper to hire your skis or snowboard when you reach the ski resort. It’s worth checking the hire shops on the internet for deals before you leave. You may even find some discount vouchers. 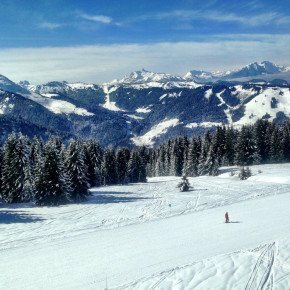 We travel to Avoriaz in the French Alps by car on our annual ski trip and there’s plenty of room to pack all our ski gear. We’ve got a lockable ski rack so skis go on the roof. If I’m flying out then I’ll just take my Head boots. After a really painful experience with hired boots I always take my Heads which are the most comfortable boots I’ve ever worn. Let’s start at the bottom ­– literally! 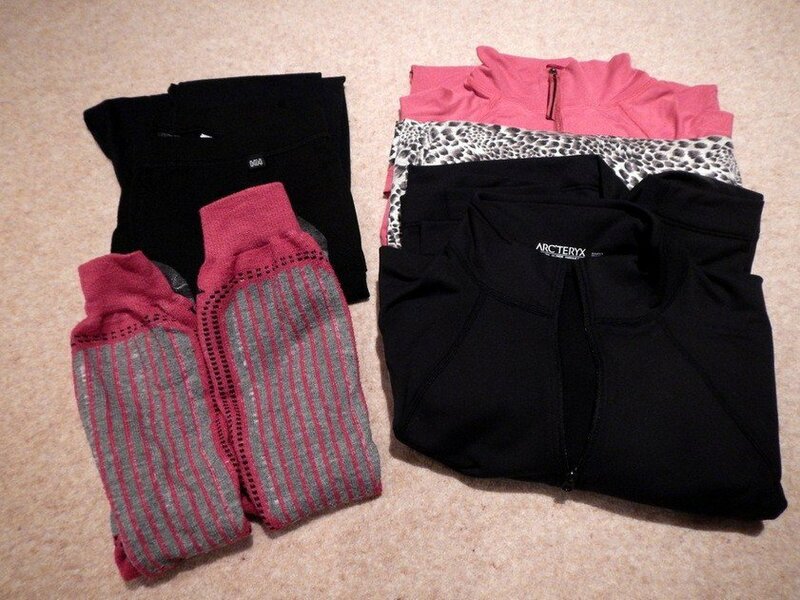 Pants, well thermal leggings and long-sleeved thermal vest base layers. Scientifically designed synthetic fabrics cling to the body and keep you warm, retain heat and wick moisture away from the skin. Wool makes for a good base-layer too. Having a good insulated base-layer is crucial for keeping warm in the cold. Make sure the tops are a good length so you can tuck them in. A high neck with half-zip will keep you extra toasty. Pack one for every 2 days. Thick, warm thermal ski socks (four pairs) – I prefer them long, up to the knee, without seams otherwise they’ll rub in tight ski-boots. Micro fleeces make great mid-layers and I take two thin and two thicker fleeces. I like fleeces which have a high neck and half-zip with sleeves which tuck over the wrists with a thumb-hole. It’s good not to have any gaps where the cold can creep in. Snowboard or a ski jacket with hood. (I’ll be skiing) The hood on my jacket can zip right the way up to my nose – useful when it’s snowing hard as it protects my face. There are also loads of pockets (phone, money, tissues) and a lift-pass pocket in the arm which makes for easy scanning when going through the ski-lift gates. 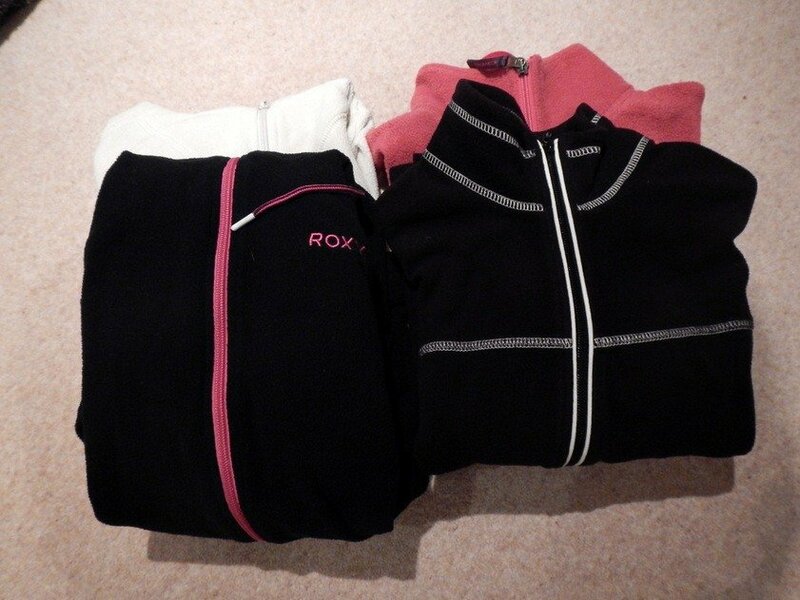 Ski pants or board pants – I’ll be taking two pairs one black, one pink! Can you see a theme yet? Gloves – 3 pairs. A pair of glove liners, and pair of ski gloves and an old pair of gloves that will be left in the car in case I get to the mountain and find I’ve forgotten my gloves. This happened once and I had to buy more – proved costly! I’ll also be taking a snug fleece hat that covers my ears and a neck warmer. Goggles – absolutely essential when it’s snowing. Sunglasses are essential because the sun is really intense when it reflects off the snow. 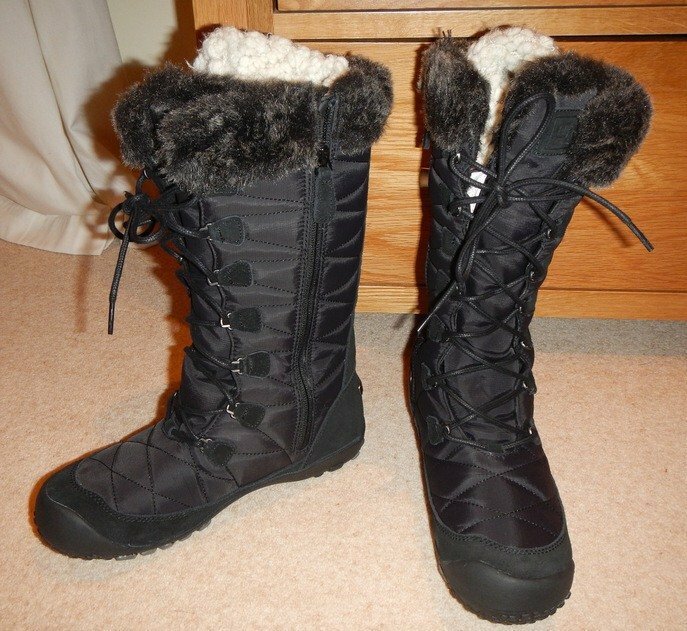 I have ski-boots, skis and poles now – I used to hire (had one horrendous day on the slopes with ski-boots half a size too small and as a result three even more horrendous days not being able to walk properly) ski boots were acquired the following Christmas. Boots, skis and poles are all packed! Grippy, waterproof snow boots for wearing to and from the slopes and in the evenings. 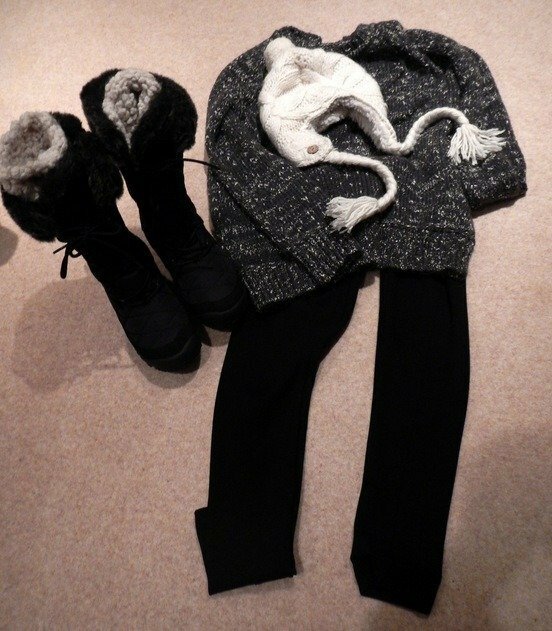 Great with jeans and a sloppy jumper for après-ski. Thermal leggings can be worn under jeans for extra warmth and a few jumpers and tops should see me through the evenings – again layering is key. 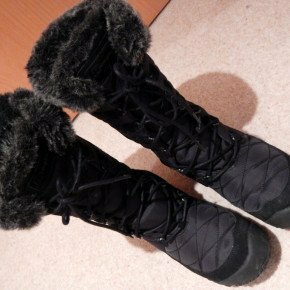 I’ll be taking Insulated Waterproof Snow Bootswhich keep my feet dry and warm. I’ve wear a Salomon ski helmet which has cosy ear pads to keep my ears warm – if it’s really cold I’ll wear an ear-warmer underneath as well. Salomon Icon C. Air 2015 Womens Ski and Snowboard Helmet In Black. That’s it as far as clothing goes but there are other ski essentials that shouldn’t be forgotten. 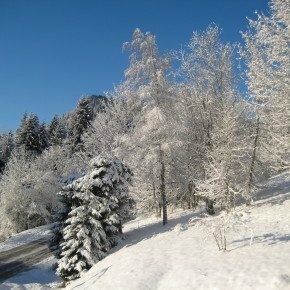 Sunscreen – UV radiation is stronger in alpine areas and when it’s reflected by the snow it’s even more severe. I take a factor 50 sunscreen and a protective lip balm. Apart from the usual holiday essentials; travel documents, toiletries, chargers etc I think that’s it. Click to download your free ski trip packing list here! Unfortunately we are still waiting for snow in this part of the world but this is a great “to check” list that I will use. A nice article. I mostly agree with you although I tend to pack lighter. 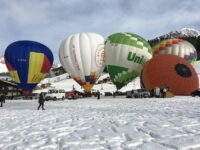 Enjoy your time in the Alps! We actually had spring like weather in January so I didn’t wear everything I took. Great skiing though! Reblogged this on South African teaching English in Ha Noi. I have undergloves as well to go inside the ski gloves, personally. You don’t use any? 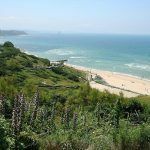 We’ve actually had amazing weather this week – really spring-like so haven’t needed the hand-warmers at all! Inner gloves are a really good idea so I might invest for next year. These are good tips, Suzanne! I’ll be skiing this winter for the first time in years (!!) and I needed a good refresher of what each layer should consist of. Enjoy your ski trip! Thank you – where will you be skiing? 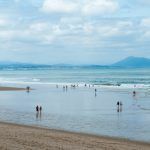 I’ll be heading up to Vermont – a big ski state in the Northeast US. Some friends rent a house up there every year and I keep putting it off! First day skiing today – lots of snow! Great list. Sunscreen is an absolute essential for a ski trip, I quite like the once-a-day stuff so you don’t need to pack it with you during the day. I slick a little bit of sunblock lip balm across my cheekbones when I do my lips to stop the wind nipping my face. It’s also important to take your sunglasses off occasionally on the lift up or sitting on the terrace of a mountain cafe to catch a little bit of sun and stop the “panda-eye” effect! So true about the panda eyes – not a good look! That first photo floored me! Great shot that makes me nostalgic for the snow and furry boots! Have a great time and stay safe on the skis and during after ski – long time since I went downhill skiing – work a season at a Swedish ski resort, never had some much fun in my life. Never been on a pair of skis before, was so afraid in the beginning … but got there in the end and nothing was stopping me from spending every free minute going down in full speed. I don’t know if I would dare to do it now again. It’s was in 1970. Haven’t done after that. Great tips, but no clothing for evenings … ??? *laughing. Can’t wait for your posts that will come out from this trip.